The Rockford IceHogs, AHL affiliate of the Chicago Blackhawks, managed just two regulation goals in their weekend road jaunt against their two most familiar division rivals. They still managed to collect three of four possible points as they kept pace in the Central Division standings. The IceHogs still are on the outside looking in as far as the postseason is concerned. However, they kept the gap between them and the two teams above them in the standings a manageable one. Collin Delia and Jeff Glass each played well enough for Rockford to take both games into overtime. The Hogs dropped a shootout with Milwaukee Saturday before going into Allstate Arena Sunday and getting an overtime win over Chicago. Rockford has had to hustle for goals, with just eight in its last five games. The Hogs have won three of those contest and picked up a point in another. This may be the case for this bunch as the season winds down. Matthew Highmore, Rockford’s leading scorer, has been with the Blackhawks for a few games now. John Hayden was recalled on Saturday by Chicago. Other leading scorers like Vinnie Hinostroza, Tomas Jurco and Erik Gustafsson have been with the Hawks for a while. The IceHogs don’t have the same explosive offensive punch they had earlier this season. Fortunately, Rockford has some things going for it. 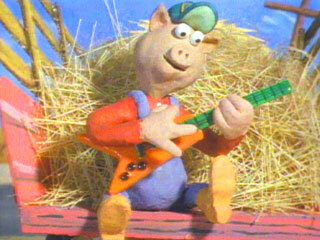 The play in goal has made it possible for the Hogs to stay in games of late. They also have some veterans on board who could make a difference in the final month of action. Cody Franson, assuming he isn’t recalled, adds leadership and a potent shot from the back end. He and Adam Clendening are both contributing to the scoring column. Franson has five goals in 23 games with Rockford; he’s tied for the team lead for defenseman goals with Darren Raddysh. Chris DiDomenico has seven points (2 G, 5 A) in seven games since coming to Rockford. DiDomenico and Franson hooked up for the game-winner against the Wolves Sunday. The play was pretty on both ends; Franson chased down a clearing attempt in Gus Macker Time and slid the puck cross-ice to a waiting DiDomenico, who showed some stick-handling skill before catching cord and ending the game in Rockford’s favor. 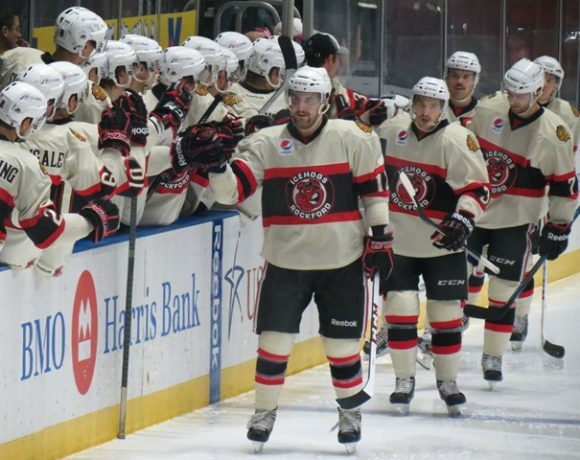 It’s possible that several players could come down to Rockford late in the season and give the team a boost in talent should a playoff spot be within the team’s grasp. Until then, the Hogs will have to make every goal count. The IceHogs were active this week. Back on Wednesday, Rockford inked former Hogs defenseman Nolan Valleau to a PTO. Valleau played in both games over the weekend, as did Carl Dahlstrom, who was assigned to Rockford on Friday. With Hayden being recalled to Chicago Saturday, the IceHogs recalled Matheson Iacopelli from the ECHL’s Indy Fuel that evening. The young forward played nine games for the Fuel and scored nine goals in his stint in Indy. Iacopelli took the ice for the Hogs for the first time in a month against Chicago Sunday afternoon. As of Monday morning, Rockford (30-24-3-4) sits in fifth place in the Central Division, despite sharing a .549 points percentage with sixth-place Milwaukee. Rockford picked up a point, but found Admirals goalie Anders Lindback hard to solve and dropped this one in the shootout. The Ads got the scoring started in the middle frame, taking a 1-0 lead on a Trevor Smith goal 4:15 into the period. Rockford out shot their opponents 19-5 through the first 40 minutes but had nothing to show for it. William Pelletier got the Hogs even on the scoreboard midway through the third period after gaining possession of a loose puck in neutral ice. The speedy forward made a beeline for the right dot, flinging the puck past the glove side of Lindback at the 12:08 mark. The score remained 1-1 through regulation and an exciting overtime period which saw both teams foiled on several scoring chances. The third point was decided by penalty shots, specifically Justin Kirkland’s. His attempt beat Delia in the first round; Anthony Louis, Adam Clendening and Chris DiDomenico came up empty and Milwaukee picked up the win. Allstate Arena has been a tough place for any AHL team to get a win the last couple of months. The Hogs needed Gus Macker Time to do so but posted two huge points against the surging Wolves. As was the case the night before, it was a goalie duel. 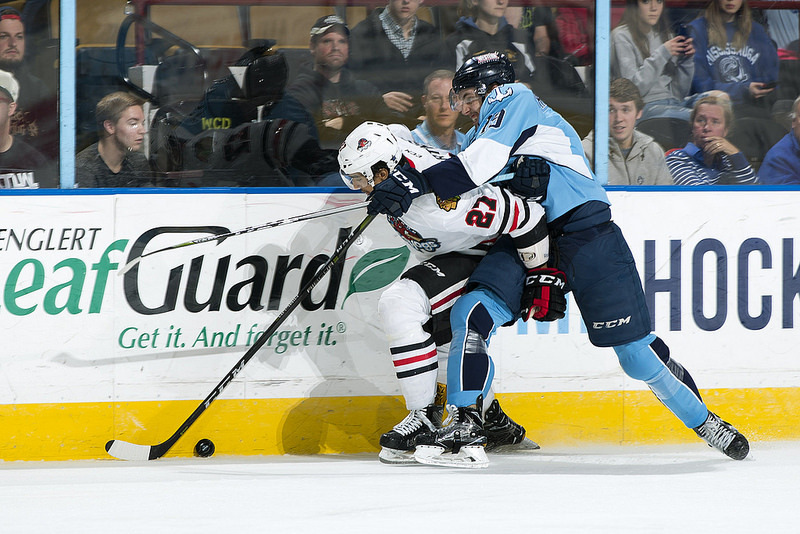 Sunday, the combatants were Oscar Dansk for Chicago and Jeff Glass for Rockford. Neither team found the net in the first period. Dansk stopped 14 IceHogs shots in the first 20 minutes, then foiled William Pelletier on a penalty shot early in the second. Rockford opened the scoring when Cody Franson pinched to the right dot, one-timing a feed from Andreas Martinsen coming around from behind the Wolves net. The goal came at the 6:29 mark; the IceHogs held onto that lead until midway through the third period. Rockford appeared to take a two-goal lead when Adam Clendening centered to Henrik Samuelsson 7:31 into the final frame. However, the replay showed that Samuelsson had kicked the puck past Dansk. Chicago’s Teemu Pulkkinen knotted the score at a goal apiece with a power-play re-direct at 12:52 of the third. For the fourth time in the season series, the Hogs and Wolves could not settle the matter in regulation. Brandon Pirri hooked Martinsen in the second minute of overtime, giving Rockford a 4-on-3 advantage. Chris DiDomenico would capitalize for the IceHogs, benefiting from an outstanding play by Franson. Chicago’s T.J. Tynan had pushed the puck toward neutral ice. Before he could complete the clearing attempt, Franson beat him to the puck and slid a pass all the way to DiDomenico at the left post. The shot beat Dansk to the twine and seal a huge win for Rockford. Tuesday’s game at the BMO against Iowa is a must-win. The Wild sit in third place in the Central but are within reach of the Hogs. Reeling them in begins with a regulation victory. 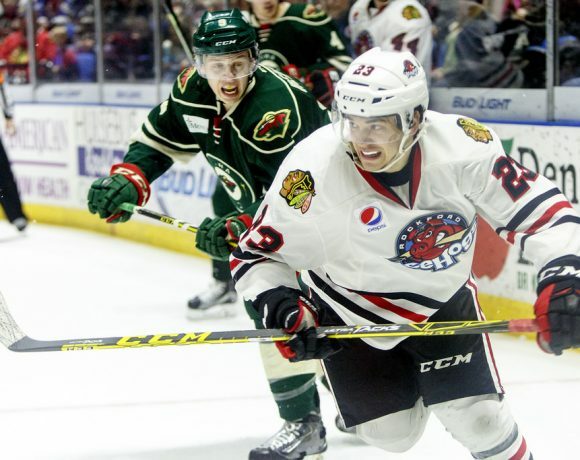 Rockford has three games remaining with the Wild; the remaining two meetings are in DesMoines. The Hogs last shot at Grand Rapids comes Friday when Rockford visits Van Andel Arena. After winning the first six meetings between the teams, the IceHogs have dropped three straight to the Griffins, who lead Rockford by four points in the standings as of Monday. Saturday night, it’s another tough go with the Wolves in their building. Each team has won four games in the season series. All four of Chicago’s wins have come in regulation. All four of Rockford’s victories have come in extra skating or a shootout. Follow me @JonFromi on twitter for my thoughts on the scene in Rockford all season long. What Do You Do With Duncan Keith So Early In The Morning?